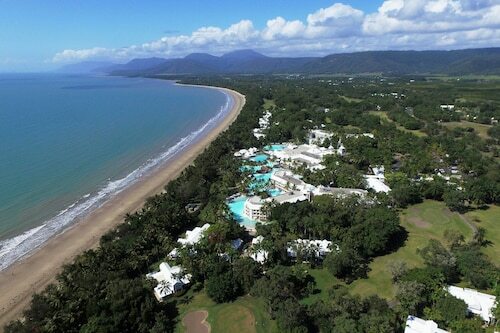 Save cash by booking a Port Douglas holiday package. Just pick your favourite options and let Expedia do the rest. Smart vacationers who book a package deal on Expedia can save up to $200*. With more than 400 partner airlines and 321 000 properties to choose from on our comprehensive database, you won't have any problems designing your ideal holiday. You can alter your holiday plans with us because we do not charge cancellation fees for almost all of our bookings. There are loads of awesome things you can do when you visit a new place. So why not get your trip to Port Douglas off to a sensational start by perusing some of our ideas? After all – out there starts here! Have a fantastic time and help a great cause to boot at Wildlife Habitat. Experience a tour and observe these beautiful creatures in their natural surrounds. Travellers in this destination have a great range of options. Eager to add some greater meaning to your holiday? Go on a pilgrimage to St Mary's by the Sea Chapel. No matter your beliefs, it's a great place to educate yourself about the local faith. Still have time to spare? Eager to take in a conference or cultural event while you're in the area? Check the calendar at Sugar Wharf and find something that captures your interest. Travelling isn't just about checking off new destinations on a map. It's about the friends we make and the adventures we have on the way! 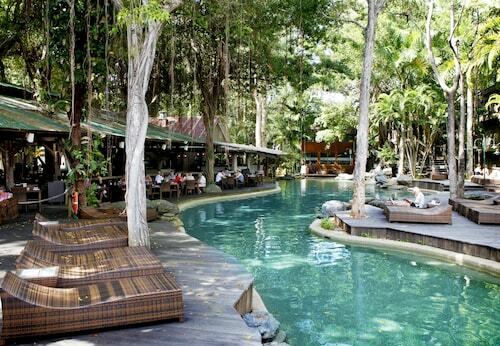 For a more comprehensive list of activities, jump onto our Port Douglas things to do page. 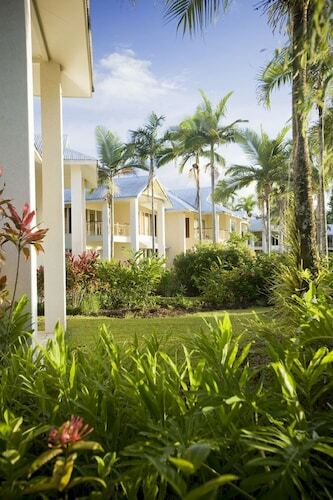 With around 82 accommodations in Port Douglas, finding a place to stay won't be a problem. But why waste time? Book now via Expedia and jump-start your next cheap holiday or luxury getaway. 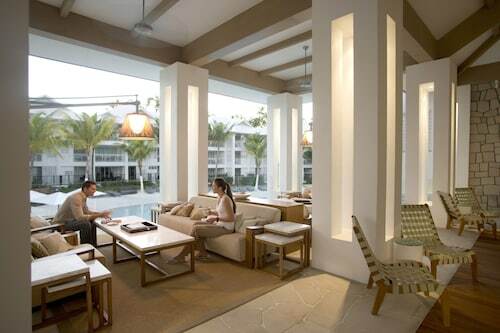 Valet parking, sunken bathtubs and fine furnishings are just some of the things you can enjoy at the Niramaya Villas and Spa (1 Balé Drive) and the Coconut Grove (56 Macrossan St). Book now for a taste of the high life! If bargain travelling's more your thing, you (and your wallet) might like the Port Douglas Backpackers (37 Warner Street), or the Global Backpackers - Port Douglas (38 Macrossan Street). If you're arriving by plane, it's most likely that you'll be touching down at Cairns International Airport (CNS). 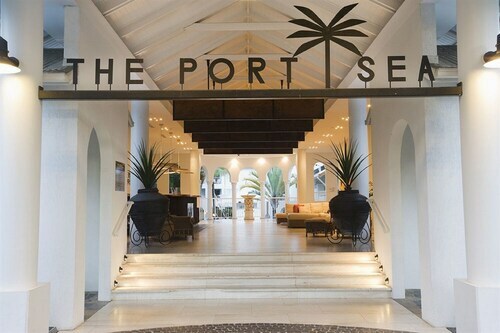 Once you've grabbed your suitcase from the carousel and wandered outside, the central area of Port Douglas will be waiting 35 miles (56 km) away. A local historic icon, this former working dock, recently restored, is now a functions venue popular for weddings in Queensland’s Tropical North. On the beautiful waterfront at Port Douglas you can fish, shop, have a relaxing afternoon drink and watch the boats as they sail in and out of port. 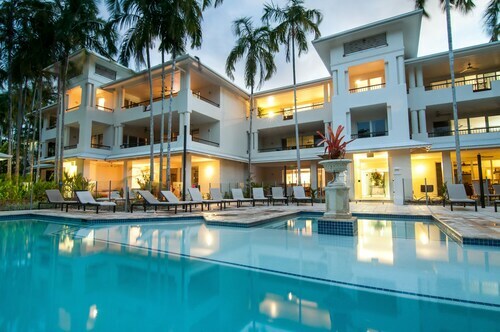 Looking for Flights, Hotels, Car Hire and Holiday Rentals in Port Douglas?